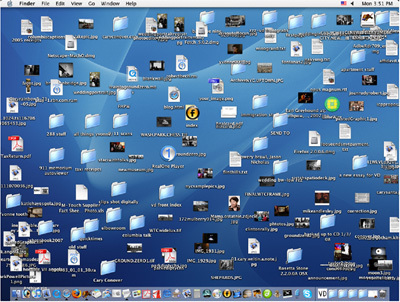 Here is a screengrab of the chaos that is my computer's desktop. In an odd way, I am sort of proud of the mess. I spend a lot of time at my computer, and I like having everything in front of me. But every once in a while it'll get so cluttered that I'll create a folder, call it "old stuff" and just drag everything on the desktop into it to make room for new things. My apologies for shrinking the above jpeg down to 400 pixels. I wouldn't dare post it at 100 percent, as there's some sensitive intel on there.